The Dover™ Urethral Universal Tray by Medtronic comes with all the needed components for a sterile catheterization procedure. 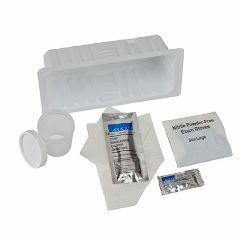 This tray includes Underpad, Waterproof Drape, Lubricating Jelly, BZK Swabsticks, Nitrile Exam Glove, and Specimen Container. Collection type: 1200cc graduated tray. This product is sterile and contains natural rubber latex. Catheter, Balloon and Bag not included.